The finds, which are 50 million years older than any other fossil fish in Africa, will help provide a "missing link" in the evolution of early fish. The first of eight fossil specimens was dug up in 1994, and named "Nelson" after the newly elected president. The research is being conducted by a UK-South African team of scientists. "These new fish finds are among the most exciting ever," said Richard Aldridge of the University of Leicester. "People may wonder how we know these fossils are fishes, when we have no bones with which to identify them. "The answer is that the exceptional preservation displayed in these rocks enables us to recognise the eyes, scales and even the livers of the animals. The impressions in the shale are faint, but they are also clear and diagnostic." Professor Aldridge and his team have been working on the deposits in the Cedarberg Mountains, South Africa, for 15 years. After finding Nelson, the team had to wait another 11 years before they found, amazingly, seven additional specimens in quick succession. The animals lived during a time when Africa was in an ice age, and before any animals had colonised the land. According to the team, they lived in a shallow sea fed by melt waters from receding ice-sheets. Although the researchers are still in the early stages of analysing the fossils, they think the fish might have been swimming scavengers. "They had no teeth, so they might not have been predators," Professor Aldridge told the BBC News website. "They may have been scavengers - they would have fed on detritus probably. "But they certainly could swim. The bottom conditions in this sediment were very stagnant, so little could live on the bottom." Professor Aldridge and his team hope the new fossils will help piece together the puzzle of fish evolution. "These exciting fossils will help fill in the 'missing link' in the evolutionary history of very early fishes," Professor Aldridge explained. Each new fossil find helps to paint a more complete picture, and indicate when various new adaptations evolved. "The fossil record confirms that the evolution of fish was a step-wise event," explained Professor Aldridge. "The various characters that make up a fish, or a vertebrate, didn't all appear at once - they were added one by one through evolutionary time. "These [new] fossils help fill in this pattern of how early vertebrate evolution began." Nelson and his counterparts are not the oldest fossil fish ever to be found. 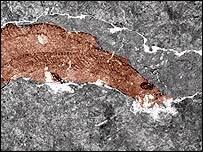 The fossil of a fish that lived about 530 million years ago in China was found in the late '90s. But these 450-million-year-old specimens are particularly interesting, Professor Aldridge believes, because they counter the idea that early fish developed mainly in the north. "These fossils are important because there is a theory that the origins of fish really took place in the northern continents, and then spread south," he said. "This find [from Southern Africa] dispels that theory."